A local pileated woodpecker makes his way up a tree in search of ants, his favorite food. At the right is an example of his handiworks. Back when we were growing up, we had one of those squat console television sets in our family room with rabbit ear antennae. It was one of my brother’s jobs to wrap hunks of tin foil around those rabbit ears and to adjust them based on the prevailing winds so that we could tune in our favorite shows. My job was to turn the channel, and that was back before remotes and actually involved leaving the comfort of our sofa and trudging across the room. When “Leave it to Beaver” wasn’t on, we liked to watch “Woody Woodpecker.” We were glued to this bird’s antics and we’d replicate his maniacal laugh long after the show was over, and our mother had sent us out to play in the street. It turns out the creator of Woody designed his cartoon based on an acorn woodpecker out on the west coast, although the birding community agrees that many of his characteristics are those of our majestic pileated woodpecker. If antiquated cartoons are not your thing, the pileated graces the Hartford Audubon Society’s logo as their bird of choice. He’s definitely one worth looking for. The pileated is, in my opinion, the king of local woodpeckers. He is 16–19 inches long, black and white with a brilliant red crest and eyes that look right through you if you are lucky enough to be close enough. He pecks rectangular shaped holes in trees in search of ants and other insects. The pileated prefers mature forests and is found throughout town. If you stop and listen on a still day, you may hear him hammering on a hollow tree. It’s hypnotic. By this time of year, he has found a mate and they are getting ready to shack up in the most romantic of places, a cavity in a tree. There, the female will lay three to five eggs, and the parents will share the care of their growing brood until they are ready to take flight. The real estate developed and occupied by our pileated is popular once the woodpeckers have fledged. 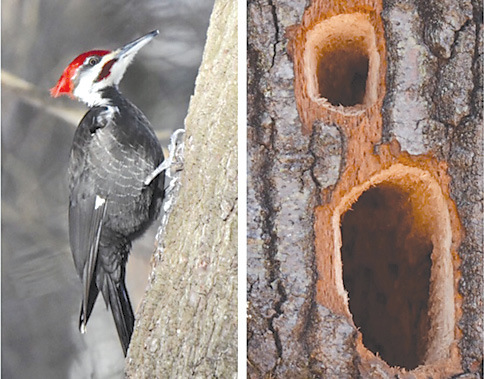 Birds such as owls, chickadees, nuthatches and warblers all queue up to move into homes built by woodpeckers. So, the pileated pays it forward, big time. You can see pileated woodpeckers in many of our wide-open spaces around town. If you are hoping that a pair will set up shop on your own patch of earth, you need to pace yourself in the woodlot management department. Pileated, and countless other birds, insects and mammals, love a standing dead tree or two, and fallen ones are nearly as exciting. So, let your chain saw accumulate dust in the barn, and just maybe if you watch the forest evolve as it has been doing for years, living and dead trees happily comingling, then maybe you too will be host to the king of local woodpeckers.